New from Glen-L: Folding boat? We've been tweeking and changing the Online Store as we receive customer feedback. We expect to making more changes... 'til we get it right. Over the years we've had customers ask if we had a fold up design. Well now we do. C-Flex. I received a call from Bill Seemann to tell us that the note in the Online Store that C-Flex is not available is wrong. See the article in this WebLetter for details about how to order. I'd like to thank the contributors to this WebLetter. We couldn't do it without you. Online Store... It's here! It's here! A last minute note: We may be making some changes to the online store that will alter some of the following. The changes will be made to address some of the suggestions made by visitors. We will include an update in the next WebLetter. Our website has a new look. For those familiar with the old Online Boat Design Catalog, the changes have engendered confusion... "where did it go?" Well, it's still there, but you can't get there from here. To see the design catalog, you visit our Online Store. Not everyone has been thrilled with the change, but there are some definite advantages. Not the least of which is the price of the plans or kits are on the description page. Another advantage is that designs are shown in more than one category, so that Workboats or Cruisers are also listed in Inboard or Outboard categories. Since many of the Inboards have an Outboard option, they will be in both categories. What this means is that you have more choices. So where is the old Catalog? It was not possible to include all information contained in the old Catalog in the Online Store, so we have linked to the old pages. Follow the "Additional Specifications and Photos" link from the design page. We will continue to add additional information to these pages. There is a link at the bottom of the old page to return you to the store. When we set up the Store, we were able to import previous customer information. Seemed like a good idea... the Store knows who you are which would simplify ordering. The program sent all customers their password, IF we had an email address for them. If you attempt to log on and you get a "The email address and password you entered don't match any account in our database. Please try again." message, follow the directions below. Click on the button that reads "I already have an account set up with this store"
Click the link right below to have your password emailed to you. This will be done instantly. Check your email to get your password and then proceed with logging on to order. Of course, you do not have to login to view the site, just to place an order. Eventually the pre-existing password problem will no longer exist. We feel that once you get used to the new pages, you will learn to love them as we do. A word about ordering. Plans and patterns are no longer sent prepaid in the US. Instead of raising plan prices, we have left them the same as they have been for the last two years and now charge postage. When you place an order, you will be asked to choose a shipping method, be sure to check all shipping options as some are more expensive than others. The default is UPS unless you specified some other method during log in. For hardware, fastening and other kits, this is usually the least expensive method, but for lighter items such as Plans and Patterns and Study Plans, Priority may be cheaper. In addition to Boat Plans our Online store also includes Supplies and Books and Videos. In the future we will add Inboard Hardware. For now, Inboard Hardware can be purchased using a separate order form, accessible from the Inboard Hardware catalog pages. See below for a few of the comments received regarding our new store. Barry, I hope you are still there; but what has happened to Glen-L's website? I guess most everything is unchanged, except your "On-line Catalog"! I suspect in the last ten years I have hit on your site, as much, or more, than anybody! Today I go in, and rather than get a picture of some future boat that I might want to build, I get some two dimensional sketch! I'm not the smartest computer guy, but your website is tough, and it's getting worse! When we added the new Online Store, I initially had both the shopping cart and the Boat Design Catalog as links. This seemed to me to be confusing. Especially since I wanted each BDC page to link to the Online Store, not back to the Boat Design Index. If you go to the Online Store, instead of seeing boat names, you will see a small drawing. Also, since many designs fit into different categories, they now appear in multiple categories instead of just one. i.e. some inboards are also outboards, cruisers or workboats. On each design page, there is a link to the old Boat Design Catalog page (Additional Specifications and Photos), with its links to photos, bill of materials and sometimes "Notes". This looks like an excellent sales tool. If I were a bettin' man, I'd bet you have a winner in this addition! The 10% discount will probably kick some folks off TDC to get started, too. Wow ! What a major improvement ! Many of you have noticed the notes on our site that C-Flex is no longer available... well it ain't so. The distributor "Seemann Fiberglass" is apparently out of business, but "Seemann Composites", the manufacturer, is not. For those interested in using C-Flex for your one-off fiberglass project, please see the email message below. Thanks for the time you spent with me on the phone today. Anyone wanting to buy C-Flex should contact us directly as we are, and always have been, the actual manufacturer, with Seemann Fiberglass acting as the distributor. Contact info: Seemann Composites, Inc. Please call us with any questions or problems and let your customers know that we will be happy to ship C-Flex to them from here. Folding boats are not new. Companies making frame/fabric folding kayaks have been around for years. However, little has been done lately to develop a boat of this type that can be home built. The idea isn't new either. We have material printed back in the forties describing how to build such a craft. They were built from plywood with folding seams made from canvas and extensive use of copper rivets, common fasteners of the day. Canvas is not waterproof, although current treatment makes it virtually so. Today we have superior adhesives, sealants, and flexible, truly waterproof material for seams. When we decided to design a folding boat we thought it would be easy and take very little time. How wrong can you be? The project was one big headache. The original concept was changed so many that it barely resembles the end result. If we got paid by the erasers used, we'd be wealthy. It wasn't that developing the lines was simple, but making the damn thing buildable and easily folded together, with leakproof seams, turned out to be the real problem. The designers quickly developed the lines and figured out many design details. Simple! Then a small cardboard model was made. It looked good until we tried to fold it up; it wouldn't. 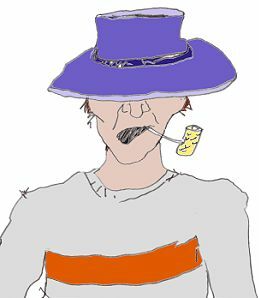 So back to the drawing board; not just minutes, but hours, getting ideas, rejecting most, ad infinitum. And cardboard models galore. Razor knives and scissors worked overtime and waste baskets were full of scraps and rejected ideas. Eventually the light began to shine, the basic nuances were figured out and EUREKA we had a model that would fold. Draw it up so the shop could build the prototype and we're on our way. Wanna bet? Someone forgot to consider that thin cardboard and plywood are not the same. With a boat that folds, fractions do make a difference. The thing wouldn't practically fold. We started revisions. How many? Too many. But eventually it worked to our satisfaction. Now to change the drawings and make full size patterns of the parts to match the prototype. Done, NOW we're home. Don't bet on it. When building the prototype, we used a minimal number of hinges at the seams. No problem, the small gaps between would be taken care of with the seam material; seam strips that were to bend wouldn't but sawing them to shape could be done, etc. Get the idea, things uncommon to anything done in previous designs kept cropping up, all generally relating to those folding seams. The "no problem" small seam gaps wouldn't go together. Sure extra hinges and some trimming of the planking solved the problem. But the designers had to change all of the drawings and modify the patterns. The problems causing modifications never seemed to end. But at last all were solved and corrected? Don't bet on it. The prototype parts were painted and the hardware, hinges, barrel bolts etc were installed. Now the culmination of the project, folding the parts into a boat. All the time and frustrations ending at last. Wanna to bet? Everything was going great, until... we tried to put in the center form. It could be forced in, by two husky guys, but that wasn't desirable. So modifications had to be made again. In the meantime, of course, the designers had completed the drawings and developed the instructions. All were ready for final proof. But again, changes had to be made to include the modifications required. At least the instructions text, thanks to word processors, was easy to change, but the drawing vellum was getting worn thin. We finally worked out all the bugs and completed the "simple" folding boat, "FOLD UP" and it floated! Will we ever make enough money on plan sales to pay for the many hours spent? Very... very, improbable. Did we learn anything? Could we start from scratch and do another folding boat without problem? Absolutely. PS: The photos show that FOLD UP is a reality. The 10' 1" length with 52" beam provides a roomy, stable craft. It folds easily and fully unfolded, ready for the water weighs, only 105 lbs. The hull is 1/4" plywood and all parts are given as patterns with full procedural instructions. All hardware and seam material called out is readily available with sources given for items possibly not available locally. Plans and patterns for FOLD UP are only $60.00. You too can have this novel folding boat with just a little effort. And you CAN bet on that! There has been a continuing discussion about things Hankinsonian on the Boatbuilder Connection. There has been talk that Ken was abducted by aliens (the flying saucer kind), or that he had moved to the jungles of Brazil to "get away from it all", or even that he had died. Well, it ain't so. Ken is traveling around the country with his wife Elaine. He stopped by a couple of weeks ago. I asked how people could get in touch with him... "they can't"! he yelled as he ran out the door. Here is a set of pictures for my completed Console Skiff with the optional bulwarks. The boat was a joy to build. The plans, instructions and your support made this boat easy to build. I chose the Console Skiff for a number of reasons. 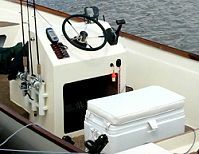 I wanted a boat that I could use primarily for fishing in freshwater lakes and protected ocean waters of New England. I wanted a boat that was light enough to tow behind just about any vehicle. I wanted a semi-v hull that would work well with a moderate size outboard. I wanted a boat with traditional looks. The Console Skiff met all of the criteria. 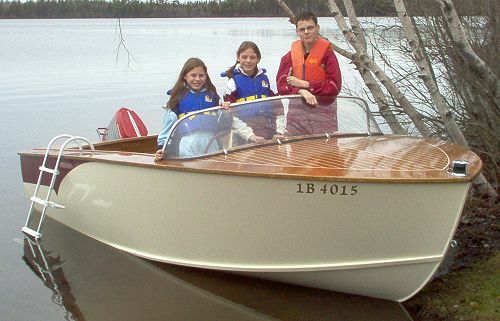 I also considered the Jimbo, but I basically fell in love with the sheer line of the Console Skiff. I started construction in August of 2003. I completed most of the work and had the boat in the water in August of 2004. However, it wasn't until this spring that I truly completed the boat. The boat performs beyond my original expectations. I installed a 1985 Mercury 50hp outboard that my family has owned since it was new. This engine has proven to be a good match for this boat. Per my GPS, the boat runs about 33 mph at WOT (Wide Open Throttle) with one person in the boat. With 2-3 adults, the boat hits 30 mph at WOT. I don't have a tach on the boat and, therefore, I am guessing that the prop selection is correct. As previously noted in a Glen-L webletter, I have had my entire large family in the boat and it handled it without hesitation. At that time, we had 2 adults, 5 small children and a small dog in the boat. The boat popped right up on plane. Given the age of the engine, I am happy with the performance. If I were to purchase a new engine for this boat, I would go with a 40hp 4 stroke. I have used the boat in local freshwater lakes as well as protected ocean waters. Like any boat of similar size/weight (it is a very light boat! ), you need to slow down in chop for comfort, but it has handled real 2' waves without a problem. On one occassion, I was passed by several Navy patrol boats running up Narragansett Bay. It was fun to watch until I realized that they left a series of 5' wakes behind them. I turned the boat into the wakes, gave a little throttle to get the nose up and rode them out without a problem. I basically followed the plans for the boat. The only real deviation was the width of the motorwell. I increased the width of the motorwell to 30" to accomodate the steering gear. If I were to do it again, I think I would stick to the planned width and make a notch for steering gear clearance. It was quite a bit a of work (mentally and physically) to widen the motorwell and my aft storage compartments are a little smaller than shown in the plan. I also installed an 11.5 gallon permanent tank located under the front seat of the console. This was a modification I completed in the spring of 2005. To install the tank, I cut the floor under the console front seat and fabricated a recessed area to hold the tank. Lastly, I used a different design for the console. It is a simple console design that is working well. I just wanted to send you a picture of my completed Geronimo. I started this in February 2003 and spent many a night and weekend working on this boat. I can't say enough about the design, it is stable, handles easily and is a joy to drive. I had a guy who owns a 16' fiberglass Peterborough ski boat and commented on how the Geronimo was more responsive than his boat. It is powered by a 1961 Merc700 and has no trouble pulling a skier, kneeboard or tube. You will notice that I deviated from the topside design a bit, but it turned out quite nice I think. Pictured are the happy kids who have been waiting patiently for the boat to be finished and all agreed it was well worth the wait. I'd like to say thanks to Glen-L for a a great design and easy to follow plans. The following was found through a link (www.boatbuilder.com.au) posted on the Boatbuilder Connection. A multihull, a 4.3m 'Jetcat' built from a Glen-L plan built by Jim Ritchie from Port Macquarie. This is another easily driven hull which enables Jim to fly past all other boats on the river to get to where the big ones are biting first. 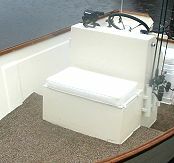 Jim has built it with a generous casting platform at the bow which, combined with the catamaran stability, makes for a very pleasant and easily handled boat for a day's fishing. There was a recent discussion on your Boatbuilder Connection concerning 'poured' lead keels. 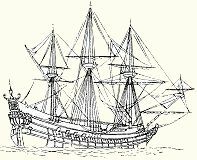 I'm in the midst of building your Francis Drake 29-foot sailing cutter (fiberglass, C-Flex), which requires 4,000 lbs of 'internal' ballast. (See 'Turning the Hull' on the Francis Drake page at http://www.glen-l.com for a view of the project). I thought you might be interested to know how I overcame the dilemma of incorporating this ballast. What was obvious to me from the start was that actually 'smelting' lead to 'pour' into the keel cavity was out-of-the-question. Call me chicken, but melting 2 tons of lead over an 800-degree fire in a suburban Los Angeles back yard held absolutely no appeal. Too, the logistics of getting all of the paraphernalia required to accommodate this operation 'inside' the righted hull was, for all intent and purpose, impractical. The sheer of the hull is seven-and-a-half feet above the floor of my boat building shed. Too, the "shed" itself is simply a poly tarp supported by 2" ABS plastic pipes - not a structure that would be happy with an 800 degree fire in its midst. Though this site usually consists of high-volume industrial and offshore lead recyclers, it occasionally has listings from smaller companies and individuals with small quantities of scrap lead. Too, I found several hundred pounds of lead on E-bay (by typing 'lead' plus 'ballast' or 'ingots' or 'pigs'). Of course, the cost of shipping lead can be more than the lead itself, so I was careful to wait for 'resource' fairly close to home. My next quandary was figuring out how to place this lead into the keel cavity as densely as possible. That is, to be most effective, the ballast needs to be as low in the keel as possible. This is where poured keels have an advantage, in that there are no voids or gaps between the lead scrap, as there could be in a 'stacked' lead keel cavity. My solution was to have my lead scrap cast into 50 lb 'pigs' by a local lead recycler. The firm I dealt with specializes in making tin/lead solder. Though not keen on dealing with a backyard boat builder on my initial phone contact, I took some photos of my hull along on our first meeting, and they immediately warmed to the project. So, I loaded my scrap into my vehicle (making several trips!) and in a few days returned for eighty, 50 lb pigs (or bricks). The fee for this process was very reasonable (they were, after all simply melting "my" lead). People ask me why I build wooden boats... I ask them why they pee. 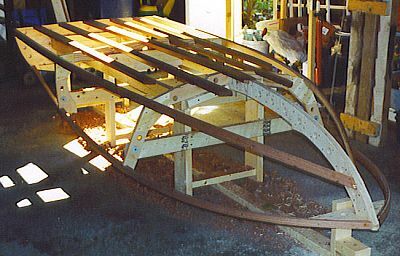 Shop Talk: Building a "rocking boat"
It was June 2003 when I first started to think about building a boat. I had just sold the hovercraft that I had built as a school project back in 1996, so there was a large space in our cattle shed where the hovercraft used to be! What better way to fill it than to build a boat! I stumbled across the Glen-L website and was inspired by the beautiful boats in the Customer Photos section. Initially, I bought the "Tuffy" plans. After doing some simple calculations, I realised that I could not afford to buy a big enough engine to give reasonable performance. So, back I went to the Customer Photos section. The classic lines of the Squirt appealed to me. A small engine would give good performance on this boat, so I bought the plans. Now, on to the construction! Comments: I am deployed in Iraq. A fellow soldier and I had the notion to build a simple boat and just wanted to see what type of easy boat plans are out there. We are interested in your 7' Dinky. It looks simple enough (this will be our first) and we shouldn't have too much trouble finding materials. He and I love to fish and build with wood. We have a small reservoir where we are and thought it would be neat to build something with our own hands to paddle around in. I recently bought a Glen L 16' Console Skiff that was built by Don Bernard of Newport Beach. An acquaintance who has apparently been lusting after one of these boats found it on your customer's completion page, and came to tell me about it. Looking this boat over has apparently convinced him to buy the kit and start building. I, too, am impressed with the design, and am becoming more so as I gain experience with it. It handles well, and is very solid and dry in crossing wakes of other boats. I haven't had it in rough water yet, but anticipate no problems. name: Paul W. Voss Comments: I purchased a "Missile" frame kit in 1961, built the boat, enjoyed it and am thinking of building another smaller boat. The kit and instructions were great and I learned a great deal during its construction. Will probably contact you soon. I have almost completed the Sneak Box. As soon as I attach the top decking, I'll cover the boat with fiberglass; attach the motor board, keel, and grassing rails; and paint it. It is the seventh boat I have built and was one of the easiest. I completed your Duck Boat in three weeks back in 1984 and have used it ever since. Attached are nice pics for your site. I ordered the plans for the Zip. I want build it for real, but I built it first as a model and gave it to a friend of mine for his birtday. When the big boat is ready, I'll send you more pics. Hello Gayle, the Riviera Plan package arrived yesterday morning. Thank you for the prompt service. It still amazes me how an order placed in the US on a Friday can arrive at my home in Melbourne Australia just on two working days later. Status: four frames up on building form. I bought my boat plans in Oct 2003 and started very slowly from Jan 2004. It was a big decision to start such a project for an absolute beginner. The other challenge I have is that I must travel 125 kilometers and pass through two immigration/custom facilities to get to my "backyard" since I live in an apartment in a city. I did not register earlier due to my slow progress. 5-04-2005: I am building the Glen-L 12, I began building the boat as a sophomore in high school and am now a senior. The hull is completed and all the trim pieces are put on. Currently I am puting Varnish and Paint on the boat. I hope to get it in the water before school is out in June. It has been a huge learning experience but has been fun to build. Photos of the boat will be sent in as soon as the boat is in the water, until then good luck to everyone building boats out there!!! Thanks for responding to my inquiry... what you be the largest size boat that could be trailered. I plan on building her in the Pacific NW, but within 2 years we are going to be residing in SE Louisiana and I plan on operating her in the Gulf of Mexico to do some saltwater fishing there. "Trailerable" generally means "without special permit". Maximum trailerable width is either 8' or 8 1/2', depending on state. Usually you can trailer wider, but requirements and limits vary by state. If you bring the boat from the Pacific Northwest, you will have to contend with regulations in each state you travel through on your way to Louisiana. Hi Gayle, I enjoyed the update so far. I built a 17 ft. sea kayak back in 2003. Both my boys have soloed on it in 03, and I am now rigging it for sailing. Summer is almost here, most of the snow and ice is gone, and I can't wait to get the kayak out on the ocean for some sailing and fishing. Rigged it for fishing last year. The sail rig, mast and boom came off a small ice boat I built two years ago. I think it will work with a bit of modification. I enjoy being part of your extended family. There must be millions of us. Comments: I think you guys are great.My dads first ski boat was one of yours.It didn't look like a rocket ship but when he fired the small block chrysler everyone had to look. Bitchin' memories! Thanks guys. Comments: hello - back in the early 70´s I built with a friend your Glen 17. It was fantastic. I'd like to build another so I'll be sending for your catalog. Greetings from Mexico!